As executive coaches, we catalyze leaders and teams. We do this because we are passionate about helping people connect to the enormous power we believe they already have inside. Our clients often tell us they want more. Individually, they want more connection, engagement, joy, growth, or sense of purpose. As teams, they want more trust, collaboration, creativity, innovation, and capacity to embrace and align across diverse perspectives. We help our clients understand how self-limiting beliefs and the environments in which they operate, hold them back from achieving their full potential. Through practical coaching, thoughtful experiments, and accessible integration tools, we help people achieve and sustain positive shifts. That’s why we named our executive coaching firm Shift 180. Please connect with us to discuss how we can help you choose what’s next for you – and your team. 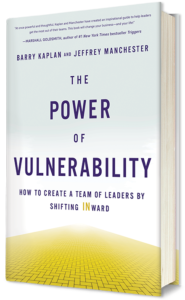 Learn About Our New Book THE POWER OF VULNERABILITY Here. This past weekend was just amazing. The awareness of the connections from my wound – to my gifts – to my life – to my purpose is beyond empowering and I am so grateful. I feel that I have seen a small glimpse of where this can lead me and that while there is much work left to be done I feel so blessed. I am so eager to start working on the next steps and truly harnessing this wisdom to further my purpose. I was awarded the Annual Presidents Award. The Team and the CEO insisted I receive the award as team leader. Before working with you I never thought that would have happened given the hurdles facing us at the beginning of the year. Many thanks again. It must be very fulfilling making such a difference in the lives of people. – Darryll Palms, Global Business Director at Gulbrandsen Inc. Yesterday was an invaluable experience and a significant turning point for our team. The insights I now have about our team (and myself) as to what has shaped us all and how that plays a role in who we are now is very important in our interactions and understanding of each other. Our goal was to open the communication lines for past issues and clear the way for the future, which I believe we accomplished. The added benefit is the bond we established and the strength in knowing that we are all IN this together. Many thanks for an incredible and important experience. Leaders, Do You Lack Authenticity?